Will Germany follow Brazil’s lead in righting the ship after a rocky World Cup start, or will the defending champ find itself keeping company with Argentina, needing help if it hopes to advance? The World Cup could take another twist when Germany faces Sweden in Saturday’s late game. Giant-slayer Mexico looks to stay on a roll after knocking off Germany to start the tournament, taking on South Korea in the second game. Belgium, one of the few top teams with an emphatic win under its belt, turns its attention to handling Tunisia in Saturday’s first game. Serbian football association Vice President Savo Milosevic is angry after his team’s 2-1 World Cup defeat by Switzerland that the video assistant referee was not consulted on a second-half penalty appeal by Serbia. Midway through the second half, Switzerland defenders Stephan Lichtsteiner and Fabian Schaer held onto Serbia striker Aleksandar Mitrovic and all three players fell to the ground in the penalty area. Serbian players appealed to German referee Felix Brych for a penalty but he waved them off. Milosevic said the VAR should have been consulted and felt his team had missed a penalty for a foul on Mitrovic for the second straight match after an appeal was also turned down in Serbia’s 1-0 defeat of Costa Rica in their first Group E match in Russia. Colombian authorities are investigating a death threat made on social media against Colombia midfielder Carlos Sanchez, who was sent off early on in the team’s 2-1 defeat to Japan at the World Cup. Police say the threat was made from a Twitter account, which was immediately shut down. Authorities are now looking for the IP address of the machine from which the message was sent. The message appeared with an image of Sanchez and Colombia defender Andres Escobar, who was shot dead on the outskirts of Medellin days after returning from the United States after competing at the 1994 World Cup. Escobar scored an own-goal against the United States and Colombia, a pre-tournament favorite, failed to get out of its group. Switzerland has come back to beat Serbia in the World Cup but may have some political controversy to go with its 2-1 win. The Swiss goals were scored by Granit Xhaka and Xherdan Shaqiri, both of whom are of Kosovo Albanian descent, and both celebrated by putting their hands together to make the symbol for Albania’s double-headed eagle. Kosovo, a former Serbian province, declared independence in 2008. Serbia doesn’t recognize Kosovo’s independence and relations between the two countries remain tense. Xhaka, whose brother plays for Albania, ran to the touchline and locked his thumbs together with fingers outstretched to make what looks like the double-headed eagle on Albania’s flag. Shaqiri ripped off his shirt and made the same gesture with his hands on his chest after scoring the winner on a breakaway in the 90th minute. The goals came after an Aleksandar Mitrovic header had given Serbia the lead in the first half. – Associated Press writer Mike Corder reported from Kaliningrad. Midfielder Granit Xhaka’s powerful left-footed shot through a crowded penalty area has brought Switzerland level with Serbia at 1-1 in their World Cup match. Xhaka fired his team level in the 52nd minute of the Group E match at Kaliningrad Stadium after a shot by Xherdan Shaqiri was blocked on the edge of the box. Shaqiri nearly put the Swiss ahead moments later with a left-footed shot off the post. Aleksandar Mitrovic had given Serbia an early lead with a powerful header. Aleksandar Mitrovic’s 13th goal in his last 15 internationals has given Serbia a 1-0 lead at half time of its World Cup match against Switzerland. Fulham striker Mitrovic rose above Fabian Schaer to head in a cross from the right by Dusan Tadic in just the fifth minute. The goal came just seconds after Yann Sommer made a good save to block another Mitrovic header as Serbia poured forward in the opening minutes. The match is being played amid tensions back in Serbia between some Serbs and ethnic Albanians from Kosovo because a number of Swiss players, including winger Xherdan Shaqiri and midfielder Valon Behrami, come from Kosovo, whose declaration of independence Serbia does not recognize. Earlier Friday, late goals by Philippe Coutinho and Neymar brought Brazil back into contention in the group after its opening draw with Switzerland. If Serbia holds onto its lead it will progress to the round of 16. A header by Aleksandar Mitrovic has given Serbia an early lead against Switzerland in their Group E match in Kaliningrad. Mitrovic rose above Fabian Schaer to head in Dusan Tadic’s cross from the right in the fifth minute. Serbia beat Costa Rica 1-0 in its opening match, while Switzerland ground out a 1-1 draw with Brazil. Soccer’s international governing body says it is helping Russian authorities identify people filmed attacking a fan in the stadium during Croatia’s 3-0 win over Argentina at Nizhny Novgorod. Footage posted on Twitter showed Argentina fans kicking and punching a man wearing a Croatia shirt on Thursday evening. One kicked the head of the Croatia supporter who was lying on a concrete walkway leading from the grandstand. The Interfax news agency cites Russian World Cup organizers as saying seven Argentina fans were charged with minor offenses. They could have their Fan ID cards canceled. The credential acts as a visa for visitors to Russia and is needed to get into a stadium. ”The organizing committee of Russia 2018 is shocked and disappointed … We condemn the appearance of violence in football in any form,” the committee is quoted as saying. Serbia coach Mladen Krstajic has made one change to his lineup for his team’s World Cup match against Switzerland. Hamburg midfielder Filip Kostic comes replaces Adem Ljajic on the left. Switzerland’s team for the match at Kaliningrad Stadium is unchanged from the starting lineup that secured a 1-1 draw against Brazil in their opening match. Switzerland midfielder Valon Behrami had missed a training session this week after being substituted 70 minutes into the match against Brazil. Serbia: Vladimir Stojkovic, Dusko Tosic, Luka Milivojevic, Branislav Ivanovic, Aleksandar Mitrovic, Dusan Tadic, Aleksandar Kolarov, Nikola Milenkovic, Filip Kostic, Sergej Milinkovic-Savic, Nemanja Matic. Switzerland: Yann Sommer, Stephan Lichtsteiner, Manuel Akanji, Haris Seferovic, Granit Xhaka, Valon Behrami, Ricardo Rodriguez, Steven Zuber, Blerim Dzemaili, Fabian Schaer, Xherdan Shaqiri. – Associated Press writer Michael Corder reported from Kaliningrad. Ahmed Musa has made a spectacular entrance into the World Cup by scoring twice in Nigeria’s 2-0 victory over Iceland. The result in Volgograd means Nigeria, Iceland and Argentina are all still in contention to advance from Group D. Croatia leads the group after two wins and has already ensured a spot in the round of 16. Musa opened the scoring in the 49th when he finished off a long-range counterattack with a composed, second-touch half-volley. He doubled Nigeria’s lead in the 75th minute after a swerving run into the area and a shot from close range. Iceland had a real chance to get one back but Gylfi Sigurdsson fired a penalty kick way over the Nigeria bar in the 83rd minute. The result lifts Nigeria into second spot in the group with three points. Iceland and Argentina each have one point. Ahmed Musa has scored again to give Nigeria a 2-0 lead against Iceland late in the second half in Volgograd. Picking up the ball on the left hand side of the Iceland penalty area in the 75th minute, Musa outran his defender, mazed his way past goalkeeper Hannes Halldorsson and picked his spot in the Iceland goal. That came moments after he hit the crossbar with another shot and less than half an hour after he put Nigeria in front with his first strike. Musa was brought into the starting line-up by coach Gernot Rohr in order to inject pace into Nigeria’s attack. Iceland missed a chance to pull one back in the 82nd when Gylfi Sigurdsson sent a penalty kick soaring over the bar. The spot kick was awarded after a video-reviewed foul on Tyronne Ebuehi for clumsily bringing down Alfred Finnbogason in the area. Ahmed Musa has scored in the 49th minute to give Nigeria a 1-0 lead against Iceland at the World Cup. Musa’s half-volley came after a quick Nigeria counter attack which started in its own area. Victor Moses crossed from the right, and Musa’s brilliant first touch saw him kick the ball in the air in front of him. He let it bounce and then lashed it into the net. Nigeria and Iceland are locked 0-0 at halftime in a World Cup Group D game in Volgograd. Iceland had its best chance in the last minute after Gylfi Sigurdsson whipped a free kick into the Nigeria penalty box but none of his teammates could stretch out enough to tap the ball into the net. The tactical changes from the coaches appear to have cancelled each other out. For Nigeria, captain John Obi Mikel is playing in a more defensive role in midfield, his presence helping to shore up the defense against Iceland’s two-man forward line. In the 1-1 draw against Argentina, Iceland played with a lone striker. Whatever the result, Iceland will still have a chance to progress in the World Cup. Defeat for Nigeria would mean it is eliminated. Brazil coach Tite says he pulled a muscle during his wild celebrations after Philippe Coutinho’s late goal in the 2-0 win over Costa Rica. Tite was unintentionally pushed to the ground by substitute goalkeeper Ederson Moraes as the coach ran onto the field from the dugout after the goal in the first minute of injury time. England defender Kyle Walker has urged the media covering the team not to revel team secrets, after a photographer tweeted an image of the planned lineup for the next match against Panama. London’s Evening Standard photographer Jeremy Selywn photographed a piece of paper in the hands of assistance coach Steve Holland showing players in formation. Other journalists defended the right to publish Holland’s handwritten notes. Germany could be without starting central defender Mats Hummels for Saturday’s match against Sweden due to a neck injury suffered in training. Coach Joachim Loew said Friday that Hummels aggravated a vertebra in his neck during Thursday’s training and he would not be practicing Friday. Loew did not say who might replace Hummels in the lineup but said Germany would need to be strong in the air if the 6-foot-2 defender is unavailable. Hummels has anchored of Germany’s defense since the 2012 European Championship and scored two goals during their run to the World Cup title in 2014, including the game-winner in the quarterfinals against France. Germany sits at the bottom of the group with South Korea after losing its opening match 1-0 to Mexico. Philippe Coutinho and Neymar have scored in injury time to give Brazil a 2-0 win over Costa Rica at the World Cup. After frustrating the Brazilians for 90 minutes, the Costa Ricans finally conceded twice in stoppage time and slumped to a second loss that ended their chances of advancing to the knockout stage. Coutinho poked the ball through the legs of goalkeeper Keylor Navas and into the net after Gabriel Jesus controlled the ball in front, for his second goal of the tournament. Neymar sent his nation’s yellow-shirted fans wild when he volleyed the ball in with virtually the last kick of the game. It had appeared as if Brazil, after a 1-1 draw with Switzerland in its opening game, was heading for another stalemate. Brazil attacked relentlessly in the second half and was awarded a penalty in the 78th minute when Neymar was impeded as he cut inside defender Giancarlo Gonzalez. But referee Bjorn Kuipers went over to look at the sideline TV monitor, then reversed the decision. Billed as one of the tournament favorites in Russia, Brazil has four points heading into its last group game against Serbia next Wednesday. Serbia won its opener and was looking to move top of Group E with victory against Switzerland later Friday. Referee Bjorn Kuipers has reversed a decision to award a penalty to Brazil for an apparent foul on Neymar in the 78th minute. Costa Rica’s Giancarlo Gonzalez put his hand across Neymar on the left of the penalty area and the Brazil forward went down. Kuipers pointed the spot. Being boring is working well for Belgium coach Roberto Martinez. Asked why this squad seemed much calmer than at previous tournaments, Martinez says they’re avoiding making headlines for off-field issues. Belgium made a no-fuss start at its World Cup, beating overmatched Panama 3-0 and now plays Tunisia on Saturday in Moscow. England is also in Group G.
Martinez cut out one potential problem by not picking Radja Nainggolan. The Spanish coach had a difficult relationship with the Roma midfielder. A Russian soccer fan who has groped a journalist during a live broadcast in Moscow has offered her an apology . The man groped DW reporter Julieth Gonzalez Theran and kissed her on the cheek as she was reporting on the World Cup last week, drawing international attention. The German outlet said Friday the man who identified himself by his first name, Ruslan, has visited its office to offer his ”most profound apologies.” It posted a video of his Skype conversation with Theran, in which he said he made a bet with a friend that he would kiss a reporter on air. Theran accepted his apologies during their conversation. Sweden has arrived in Sochi short-handed for Saturday’s match against Germany at the World Cup. Three players remained in Gelendzhik after becoming ill. Swedish coach Janne Andersson says the expectation is defenders Pontus Jansson and Filip Helander, and midfielder Marcus Rohden will fly to Sochi on Saturday and join the team. Andersson did not indicate whether any of the three will be included in the final 18-man squad. 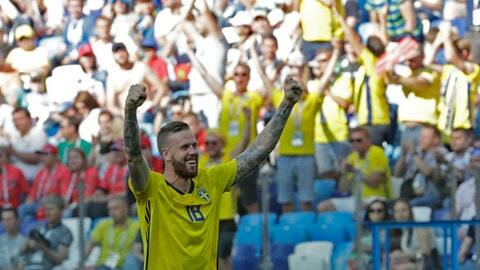 Jannson started in central defense for the Swedes in the opening victory over South Korea. Helander and Rohden were not used. Sweden forward Isaac Kiese Thelin suffered an ankle injury in practice and was not training Friday. Thelin came on as a sub late in the second half of the opener. Brazil and Costa Rica were locked at 0-0 at halftime in their second group game at the World Cup. The Brazilians were having problems breaking down Costa Rica’s packed defense, with Neymar also getting frustrated at some strong tackling – he was fouled three times in a five-minute span. Neymar was fouled 10 times in Brazil’s opening 1-1 draw with Switzerland. Brazil striker Gabriel Jesus had a goal disallowed for offside, while Costa Rica’s best chance saw Celso Borges drag a shot wide following a cut-back. The half ended with Neymar, surrounded by his teammates, remonstrating with referee Bjorn Kuipers. Costa Rica, a World Cup quarterfinalist in 2014, lost 1-0 to Serbia in its opening game. Croatia’s players have stoked ethnic tensions by celebrating their 3-0 victory against Argentina by singing a nationalist song that glorifies the Balkan country’s wartime struggle against the Serbs. A brief clip shows defender Dejan Lovren singing the song with other players in the dressing room after Thursday’s match. The song by a popular Croatian singer known as Thompson starts with a chant that was used by Croatia’s pro-Nazis during World War II. It also mentions chasing Serb ”bandits” will be chased out of Croatia – a reference to the war between the two former Yugoslav republics in the 1990s. Serbia’s President Aleksandar Vucic says Friday he doesn’t understand why the Croatian players would celebrate in such a way. Croatia and Serbia could meet in later rounds at the World Cup. Brazil star Neymar caused a stir with his ”spaghetti” hairstyle for his opening match at the World Cup. Five days later, it appears to have gone. Warming up for the game against Costa Rica in St. Petersburg, the Brazil forward had a more routine haircut with his fringe swept back and those long, curly pasta-style locks nowhere to be seen. What will he come up with for Serbia on Tuesday? This World Cup is right on pace to be the lowest scoring ever despite no goalless games so far. Just 51 goals have been scored in 23 games going into Friday’s play, at a rate of 2.217 per game. The rate was 2.212 at the 1990 World Cup in Italy – a tournament seen as a low point for exciting games. In 1990, the 24-nation format rewarded cautious play in the group stage by sending some third-place teams into the Round of 16. The most prolific World Cup in terms of scoring was 5.38 per game in 1954 hosted by Switzerland. In the 32-team tournament era, the record goals tally was 171 – a rate of 2.67 per game – in 1998 in France and four years ago in Brazil. The all-time average goals per game since 1930 was 2.85 before the tournament kicked off play in Russia. PSV Eindhoven says coach Phillip Cocu is moving to Fenerbahce and will be replaced by Australia’s assistant coach Mark van Bommel. The Dutch club announced Cocu’s departure Friday and said Van Bommel, who is Bert van Marwijk’s assistant at the World Cup, has a three-year contract to replace him. Van Bommel, a tough tackling midfielder, played at PSV for six seasons before moving overseas to play at Barcelona, Bayern Munich and AC Milan. PSV says Van Bommel will return to Eindhoven after Australia’s last match in Russia. Cocu led PSV to three Eredivisie titles in his five years in Eindhoven. Egypt is set to lodge a complaint to FIFA about what its federation chairman describes as the ”injustice” of the match officials during the team’s World Cup loss to Russia. Egyptian Football Association chairman Hany Abo Rida says the match officials ”did not achieve justice” in the game. Egypt’s 3-1 loss to Russia, combined with Saudi Arabia’s loss to Uruguay, ended its changes of progressing beyond the group stage at its first World Cup in 28 years. Egypt and Saudi Arabia meet Monday in Volgograd in their last Group A match. Abo Rida, speaking from the Egyptian squad’s World Cup base in Grozny, Chechnya, did not specify which incident would form the basis of the complaint. The Egyptians contend that defender Ahmed Fathi was pushed before the ball deflected off him for an own goal that gave the Russians a 1-0 lead. The players also thought forward Mohsen Marwan should have been awarded a penalty when he was brought down inside the box. Both incidents took place in the second half.